Develop a Hello World application in Node.js on IBM Cloud. Use asynchronous callback to call an external service. Build a rich front-end application by using React and ES6. Create an IBM SDK for Node.js application. Write your first Node.js application. Deploy an IBM SDK for Node.js application on an IBM Cloud account. Create a Node.js module and use it in your code. Understand asynchronous callbacks and know how to use it to call an external service. Understand IBM Watson™ Language Translator service. Create a Hello World Express application. Create a simple HTML view for your application. Use third-party modules in Node.js. Understand IBM Watson® Natural Language Understanding service. Use a Git repository on IBM Cloud DevOps services. Understand how to clone an IBM Cloud application. Use React to create interactive web pages. Understand the following concepts of ES6: Classes, arrow functions, and promises. 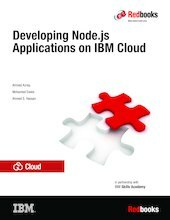 This book is for beginner and experienced developers who want to start coding Node.js applications on IBM Cloud.